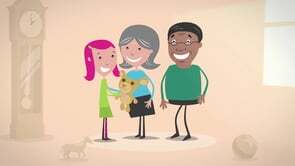 Scope asked us to create two videos to promote their fostering services, one for people already interested in fostering and another aimed at local authorities responsible for fostering services. Loaded with research and information given to us by Scope, we set about creating two very different narratives. Grace’s story was very much for an audience already interested in fostering. The key to this film was to encourage them and reassure them that Scope would be there to help. Jack’s story was aimed at local authorities responsible for fostering services so this film had to highlight ‘why Scope’ and reassure them that the service Scope offers is flexible and supported by a specialist team. We created two short animated films, with heartfelt stories to connect with our audiences on an emotional level and both films achieved just that. Our emotionally charged films saw Scope receive more than a tenfold increase in enquiries in the first week.